Narrative Lab Deadline Extended to April 2! IFP’s Independent Filmmaker Labs is the only program in the country that supports emerging independent filmmakers with projects in post-production through the completion, marketing and distribution of their first feature film. This free, year-long mentoring fellowship supports ten narrative projects each year, providing them with the technical, creative and strategic tools necessary to launch their films – and their careers. If you're a first-time narrative feature director with a project in assembly, rough or fine cut, this is the program to help you get your film into shape. Beginning with the five-day intensive in New York (June 7-11), selected projects gain editorial feedback, assess strategic partnerships & marketing opportunities, and evaluate their options for maximizing the reach of their film via festivals, traditional theatrical roll-outs or through innovative, DIY distribution methods. Filmmakers also meet with cutting-edge technologists to build their brands, as well as explore the myriad of modern web and promotional tools necessary to build engaged audiences for their projects. The year following the Narrative Lab includes continued mentorship, collaborating on a distribution strategy specific to your film, and participation in IFP's Independent Film Week: Emerging Narrative program. Past Narrative Lab Alumni have premiered at Slamdance (The Guatemalan Handshake; The New Year Parade), Sundance (The Imperialists Are Still Alive! ; Half-Life), SXSW (Jumping Off Bridges; Older Than America; Rainbow Around the Sun; Sorry, Thanks; St. Nick; The Wedding Bros.; Woodpecker), Toronto (The Real Shaolin), and Venice (Zero Bridge). Deadline for Narrative works-in-progress just extended to April 2! IFP Alum PUTTY HILL take on Austin! Last Saturday I departed a wet and blustery Baltimore for SxSW with Putty Hill director Matt Porterfield, editor Marc Vives, and our friend Amy Belk. As soon as we stepped out of the airport into Austin's perfect, sunny, 77 degree weather, we knew immediately that it would be an amazing trip. We drove with the windows down just because we could, looked out in awe of the new landscape, and psyched ourselves out for the delicious meals to be had with every BBQ and taco joint we passed. We arrived at the charming house we'd be renting for the week, just over a mile outside downtown Austin, and couldn't resist relaxing outside for a while just to take it all in. 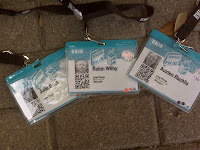 When we finally went to pick up our badges at the Austin Convention Center, the hub of SxSW, we were overwhelmed. As we made our way through a sea of film and interactive attendees and volunteers, we passed the trade show over here, promotional stands and panel rooms over there, and hundreds of posters hanging up everywhere. There was no doubt that this festival, in true Texan spirit, was huge. On Sunday evening, the whole Putty Hill family got together: Myself, Matt, Marc, Amy, Jeremy Saulnier (cinematographer), Eric Bannat (producer), Steve Holmgren (producer), and Rachael Rakes (publicist). Even our producer and co-writer Jordan Mintzer flew in from Paris and spent less than 24 hours in Austin just to make the premiere. We met up at a food truck on E. 6th St called Lucky J's to enjoy some pre-North American premiere chicken and waffle tacos, which, I might add, were delicious and are highly recommended. Our premiere was at the Alamo Lamar, one of the bigger theaters at the festival. There were some minor issues with the image quality of our projection, but no one seemed to mind as the film was very well received by our audience. One woman even commented that Putty Hill was the most authentic film she has ever seen(!)... does it get better than that? Following our North American premiere, in true Putty fashion the team went to local dive bar The Liberty for a modest but memorable celebration. We don't remember what happened next. Our two remaining screenings were at the Alamo Ritz, in the heart of downtown on 6th street. This theater was smaller but a nice size; more intimate, and very well-suited for our film. Matt, Marc, Amy and I all sat through the final screening last night, and we were glad we did because it was an interesting experience watching the film with an American audience after our premiere last month in Berlin. I enjoyed hearing laughter at certain nuances and moments of humor in the film, which I think were missed in our screenings in Germany. The projection looked perfect, and again we had a really wonderful Q&A with people who were enthusiastic about the film and asked thoughtful questions. Aside from the beautiful weather, friendly atmosphere of Austin, and our successful screenings, I can't forget to mention another highlight of this trip... the FOOD. 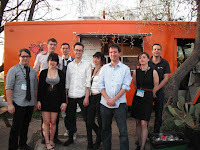 I love the food truck culture in Austin and my favorite was Chi'lantro, which served up Korean-Mexican fusion. The Al Pastor plate from Al Pastor restaurant, as introduced by SxSW Manager/Programmer Jarod Neece, was a delicious deal. 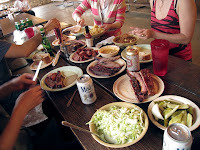 We even ventured out to Driftwood, TX to eat at the famous Salt Lick, which was easily the best BBQ I've ever had. Watch IFP's SCRIPT TO SCREEN CONFERENCE this weekend on UStream! In a historic first for IFP, we will be streaming 6 out of the 11 panels of this weekend's SCRIPT TO SCREEN CONFERENCE on our Ustream.tv Channel here or in the middle of our homepage. So even if you're away from the city, you can still see Terry George (HOTEL RWANDA), Steve Bodow (THE DAILY SHOW), Lena Dunham (TINY FURNITURE) and numerous others talk about making a career in independent film. Moderated by Scott Macaulay, Editor in Chief, FILMMAKER MAGAZINE. I’m the director of War Don Don – a feature length documentary premièring in competition at SXSW. I’m totally bleary-eyed, but also still giddy from excitement of bringing the film into the world. It’s been a whirlwind few days between screenings and barbeque and meetings and breakfast tacos and parties and superb guacamole. I have not gone hungry in this city, and while I’m keen to write some restaurant reviews, I’ll keep my blogging to the cinema. I’ve found Austin audiences to be as warm and lovely as Austin weather - and both our screenings were well-received, followed by engaged and thoughtful questions at Q&A. The festival has been in excellent order and things have moved seamlessly. It’s been busy, but I’ve had time to see some other films – and there are some very very good ones out there. NY Export: Opus Jazz and Marwencol were two that I found captivating. The Canal Street Madam had an excellent audience response. When things quiet down after tomorrow, I’ll see more. Andrew Gori, MY THIRTY YEAR WAR. on Saturday, March 20th at 1:30 pm. To see what the winning pitches are, and how these filmmakers fare, purchase your weekend pass now! Good morning from SXSW! I’ve got just over a full day left at the fest, and I’m starting it with screenings of two IFP films in competition – Miao Wang’s Beijing Taxi and Cameron Yates’ The Canal Street Madam. Both have had outstanding marketing schemes at the fest. At the Beijing Taxi party – Beijinger 80s-style punkrock bands playing in a Mexican bar – Miao (with her parents as assistant marketers) sold t-shirts and one-of-a-kind flipbooks showing scenes from the film. The Canal Street Madam branded condoms, including their screening times, were a huge hit at all the parties. Looking forward to seeing both films at the Alamo Lamar today. I am in love with that theater chain (thou I am certainly not their only suitor) – there’s nothing quite like being served pizza, beer, and a chocolate peanut butter milkshake during a film. SXSW has have commissioned a series of 30-second intro reels, magical realism hazards of filmmaking, from filmmaker David Lowery (his St. Nick is a Narrative Lab alum and premiered at SXSW 09). SXSW's originality has made the filmmakers here step up their game. Life 2.0 had a Q&A via Second Life, the Happy Poet team parked the vegetarian food cart that is the center of the film in front of the theater (I'm pressing them to put recipes on their website), and to my glee, everyone seems to have clever 1/2" buttons with images from their films. Yesterday I was a Programmer in one of SXSW’s Mentor Sessions. I’ve only ever been on the producing side of this event, so it was fun to have my own speed dating table and meet new filmmakers working on great projects. The SXSW jury awards presentation is tonight - fingers crossed for our films in competition! Yesterday was a momentous day of firsts: my first time in Austin, TX; the first time I've ever seen a film I directed play at a "real" festival; and the world-premiere of my short film LOOP PLANES. My producer (Julie) and I began our adventure to the SXSW Festival in the midst of a horrible NYC rainstorm and a delayed flight. There was quite a bit of terrifying turbulence, but I got to watch UP IN THE AIR, so it wasn't so bad. We were welcomed into Austin by beautiful 70 degree weather and met up with "Loop Planes" Co-Writer (Austen) and her Fiance (Jason), who had flown in from LA. I immediately fell in love with Austin, it's such a beautiful city, brimming with exciting and positive energy. The Festival itself is enormous and includes: Film, Interactive Media, and Music. The number of attendees, as well as the number of volunteers that run the Festival is overwhelming, and the vibe is amazing. explores gender in a totally unconventional way (you'll have to watch the film to find out more), while "His & Hers" reinforces conventional gender roles. So, on the one hand because people were there to see the feature and the audience was the opposite of the target audience for our film, I'm not entirely sure whether anyone there totally "got"it; but on the other hand, I hope this film opened people's mind a little or introduced them to material they would otherwise not be exposed to. After our screening, Julie and Austen and I got our pictures taken in front of SXSW's "red carpet" -- another first, and incredibly surreal. Then we went to a little tex-mex restaurant, and I had probably the most amazing burrito ever. I'm a graduate student at Columbia University and because several other Columbia University students have films showing here, we're all going out tonight to celebrate! I can't wait to see more amazing films and perhaps get into a few panels and enjoy the beautiful weather for the rest of my time here. The lucky winner of the Script to Screen Conference pass is Indian Cowboy. According to Twitter, "Indian Cowboy's" real name is Nikhil Kamkolkar and he is a filmmaker/actor/writer from New York. Nikhil will get to ask the following tweeted question to writer Peter Hedges (WHAT'S EATING GILBERT GRAPE?, ABOUT A BOY, PIECES OF APRIL) in person. @#IFPS2S Is writing your second script a harder challenge? Do you or not focus the second script to be more "commercially" viable? For more information about the contest, read the previous blog post. To buy tickets and find out more about the Conference: click here. Labels: IFP, Peter Hedges, Script to Screen, Twitter, What's Eating Gilbert Grape? The lucky winner of the Script to Screen Conference pass is Jae Choe. Jae will get to ask the following tweeted question to writer Peter Hedges (WHAT'S EATING GILBERT GRAPE?, ABOUT A BOY, PIECES OF APRIL) in person. #IFPS2S Do you make a concerted effort to avoid being pigeonholed or build on what got you noticed a la genre or subject matter? First Day's SCRIPT TO SCREEN Winner Announced Below! You’ve found success by winning a screenwriting contest, selling your first script, finding representation or even making your first film – but now what? How do you leverage this success and continue to sustain a career as a writer or writer/director? What are the steps to take to ensure you get your next project off the ground and continue to stand out in an increasingly competitive creative environment? Tweet your question for Peter Hedges at IFP's Twitter Page. Make sure to include hashtag #IFPS2S. 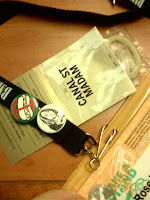 A winner will be picked and blogged about each day at The Independent Filmmaker Project Blog. The winner will win a weekend pass to the Conference, and get to ask their question in person! IFP is delighted to announce that, together with our partner organizations NYWIFT and Shooting People, we are helming the first-ever U.S. Delegation to Hot Docs, North America's largest documentary film festival. For a huge $400 off the normal price, our members who choose to attend will gain full access to the Toronto Documentary Forum (May 5 & 6) , International Co-Production Day (May 3) , and be featured in the Digital Doc Shop market. ONLY MEMBERS OF IFP, SHOOTING PEOPLE, and NYWIFT CAN TAKE ADVANTAGE OF THIS HISTORIC OFFER. Additionally, the delegation will get access to the rest of the festival: all 255 screenings, the Doc Shop digital market screening library, all Hot Docs Conference sessions and programmes, including Hot Docs Talks, Kickstart panels, CoffeeTalks and Micro Meetings, The annual Hot Docs Awards Presentation, a full roster of parties and receptions, and much more more. The delegates will join the ranks of over 1,900 registered documentary professionals from more than 25 countries, over 300 international broadcasters, film foundation representatives and acquisitions executives representing the world’s key broadcast markets, and over 400 accredited media representatives. This is not only an exciting opportunity for all of our nonfiction producing members, but also a historic one. The offer for the very discounted rate of $577.00 Canadian dollars, ends NEXT TUESDAY, March 16th. Don't miss an incredible opportunity! Read more about all eight of the delegations here. For more info on how to buy your discounted pass, click here. IFP Alum Wins Oscar, and Unlikely Kanye West-style Drama ensues! When Roger Ross Williams's documentary film MUSIC BY PRUDENCE (an alumnus of Independent Film Week's Spotlight on Documentaries), was announced as the Winner of the Academy Award for "Best Documentary Short", my expectations were for a suitably humble and hopefully short acceptance speech. Boy was I - and the dozens of people I watched with at DCTV's firehouse headquarters in Chinatown - surprised. Just a couple of seconds into William's grateful speech, he was rudely interrupted and completely overtaken by a loud woman with a very large sense of entitlement. It took only a few minutes for the Kanye West comparisons to begin, and just a few more for Salon.com to get to the bottom of the brouhaha. We at IFP have nothing but congratulations for Williams and his film. And Williams has done nothing but return the love. Check out his testimonial about IFP on our new homepage. He writes: "When I boarded a plane two years ago, headed for Zimbabwe armed with nothing more than a camera, I never thought it would lead me to an Academy Award nomination. 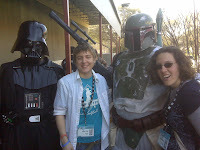 The 2008 Independent Film Week – Spotlight on Documentaries section and IFP’s Fiscal Sponsorship program helped get me there by providing the concrete support and the connections I needed to get my funding in place." Free Financial Advice for Filmmakers Tomorrow! I was alerted to this incredible free opportunity by Esther Robinson, founder of ArtHome and filmmaker extraordinaire. Since most of us HAVE used credit cards to fund a project (or even our rent), this is the perfect opportunity to start the steps of reigning in one's financial chaos. Here's the blurb: Have you used credit cards to fund a project and can’t seem to pay them down? Are you looking for free, objective, one-on-one financial advice? Join the Department of Cultural Affairs and Department of Consumer Affairs Office of Financial Empowerment for a day of FREE one-on-one financial counseling and workshops designed to help working artists and arts administrators in all disciplines, as well as independent workers reduce debt and manage credit. Details are here. IFP Alum Kim Reed Blogs about PRODIGAL SON's opening day! It’s hard to describe the anxiety surrounding the opening day of a film’s theatrical release. After three years of making PRODIGAL SONS, where so many elements are in your control, or at least within your ability to respond to surprises, on opening day there are so many things out of your control — the dark science of ads, the slippery impact of media coverage, the Wild West of reviews. Then you wake up on opening day and look out the window to see the biggest snowflakes you’ve ever seen, and they’re piling up into the fourth largest snowstorm in New York City history. It’s probably good that we didn’t know at the beginning how bad the storm would be. We had too much work to do, including many calls to Delta airlines to get my mother Carol and aunt Kathy, two subjects of PRODIGAL SONS, into town for the premiere and Q&A sessions. We were reassured by a NY Times Critics’ Pick, a New York Magazine Critics’ Pick, and a glimpse at the script of At The Movies (the Ebert “Thumbs Up” show) that told us we’d get “See It!” exhortations from A.O. Scott and Michael Phillips. And Outreach Producer Pamela Cohn had lined up great opening day co-hosts (including IFP/Filmmaker Magazine!). But on opening day one becomes acutely aware of how hard it is to translate critical acclaim and community outreach into lines in front of the theater. We even had the surreal, unimaginable exposure of a full hour on the Oprah show behind us, but our producing team (comprised of Israel Ehrisman and Jason Evans) was still hitting the snowy ground the morning of opening day. We left postcards in high traffic spots, and tossed carpenters a ten dollar bill to let us hang posters in the windows of a business under construction. The first Q&A I did was smack dab in the middle of the heaviest part of the storm, and I’d be lying if I said I wasn’t disappointed in the turnout. Then I realized that I recognized two people in the tiny crowd — David Duchovny and Téa Leoni, and they were asking great questions, not to mention generous with their praise. PRODGIAL SONS is a very emotional and personal journey, and after a year and a half of festival circuit Q&As I’m used to the emotional, personal connections our film inspires. But I don’t think anything could have prepared me for the intimacy of that first Q&A, during the heaviest part of the worst storm in the snowiest NYC February ever. This little Cinema Village snowglobe made for a nice microcosm of the documentary film world: a small percentage of discerning film lovers, harboring away from the noisy Hollywood Movie storm, riding someone else’s emotional rollercoaster for an hour and a half, then bonding with strangers over how they’ve all been moved. Moved. It’s such a wonderful idea, that we can walk into a cinema as one person, and walk out someone different. That’ll keep you trudging through the snow to hand postcards to strangers — who knows who might actually come to your next screening? How did the rest of opening day go? PRODIGAL SONS sold out the two opening night screenings, had a great Q&A session with Rick Moody (author of The Ice Storm), and got held over for a second week at Cinema Village. A national rollout starts this weekend, with San Francisco, Berkeley, and Seattle. Getting funding is the great holy grail of independent filmmaking, so it makes sense that our February 22nd Industry Connect funding panel was filled to capacity. For those of you who missed it, watch the whole thing here! The panel featured moderator Sarah Lash, (Head of Acquisitions, ATO Pictures), and panelists Jason Orans (Producer, NIGHT CATCHES US), Milton Tabbot (Senior Director of Programming, IFP), Adella Ladjevardi (Grants Manager, Cinereach), and Yancey Strickler (Co-Founder, Kickstarter).